JackpotCapital.com is inviting their players to come behind the scenes and get to know the staff. Earning points by depositing and playing as they normally would, players are introduced to the staff beginning with the Customer Service and VIP Player teams and progressing, ultimately, to the Casino Manager’s office. Everyone that makes it to the boss’ office by the end of the month will be entered into a draw for a cash bonus. By participating in the Meet the Staff contest, players will get to know personally the team that makes sure they get paid promptly, the team that comes up with the US-friendly casino’s unique promotions, and even the IT people who make sure every click works like it should. Players accumulate points while playing their favorite games. The accumulation of points will take the player on a virtual tour through the Jackpot Capital office, moving them from station to station, department to department, employee to employee until they reach the office of the Casino Manager. Players who make it to Station 9, The Casino Manager, will be automatically entered into the month-end Top Players Draw for a valuable bonus prize. The staff members that players are introduced to this week are Jessica in the Payment Dept. and George in the Security and Risk Dept. Just by entering their names as the coupon code (GEORGE) when making a deposit players get a 50% bonus (up to $100). Jackpot Capital’s Facebook Friends will find related quizzes and contests giving them even more opportunities to get to know Jackpot Capital and earn additional bonus offers on the casino’s Facebook Fan Page. 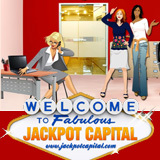 JackpotCapital.com is home to the biggest progressive jackpots available online to US players. At over $1.6 million, the Jackpot Pinatas jackpot is the largest jackpot available, but two other jackpots have also reached seven-figures. The Aztec’s Millions jackpot and the jackpot tied to both the Mid-Life Crisis and Shopping Spree slots are all well over $1 million.